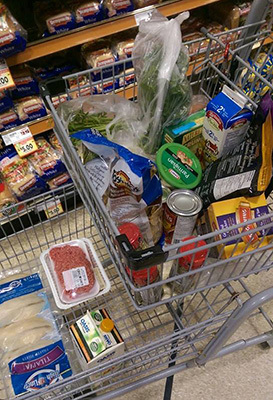 Are you buying smart when shopping for groceries? The new school year has arrived and first-year students have had a lot to prepare for: new classes and teachers, a different type of homework, making new friends and something often forgotten – buying their own groceries. There are several options of grocery stores available within walking distance of Sheridan’s Trafalgar Campus, as well as on the local bus routes. Walmart, Bulk Barn and the Real Canadian Superstore are just up Trafalgar Road and are good options for students who don’t have a large budget. Bulk Barn has a discount of 10 per cent for students on Wednesdays, and Real Canadian Superstore offers the same discount on Tuesdays. Both Walmart and the Superstore do price matching of other store’s flyers. It’s not as easy as just heading to the store, however. There are certain ways students need to shop to save money. “Check flyers and compare prices, buy bulk when you can,” said Matt Roots, 33. Roots is a carvery manager at a Fortino’s in Burlington and sees many students as they shop. He also suggests making meals in bulk and cooking what you need for the week so your meals are already planned. Roots’ plan is a good option for students. By setting aside an afternoon, students can cook what they need and plan their meals ahead. This way they will always have an option and won’t splurge on something like Thai Express or the popular Burger King. Kristen Regular, 18, is just starting out in her first year at Concordia University in Montreal, but is already confident in her shopping. “I like to think of myself as a grocery artist,” said Regular, while laughing. Joshua Scott, 25, has had a lot of experience with grocery shopping, having been living on his own for several years. Shanley McLellan, shops with her boyfriend, and always has a plan when she heads out for groceries. Brody Slacer is the front of house manager at Taste Marketeria, a fine foods grocery store in Oakville. He suggests taking cooking lessons. “If you can cook, you can save money,” Slacer said. The name of the game for student shopping is time. Saving money means taking the time to go through flyers and coupons, and cook meals on your own. There’s a satisfaction to it, though. The money saved by paying attention to how you shop makes a big difference long term. The only real problem once you’ve mastered student shopping is who’s going to wash all the dishes. Added by Cait Carter on September 16, 2015.